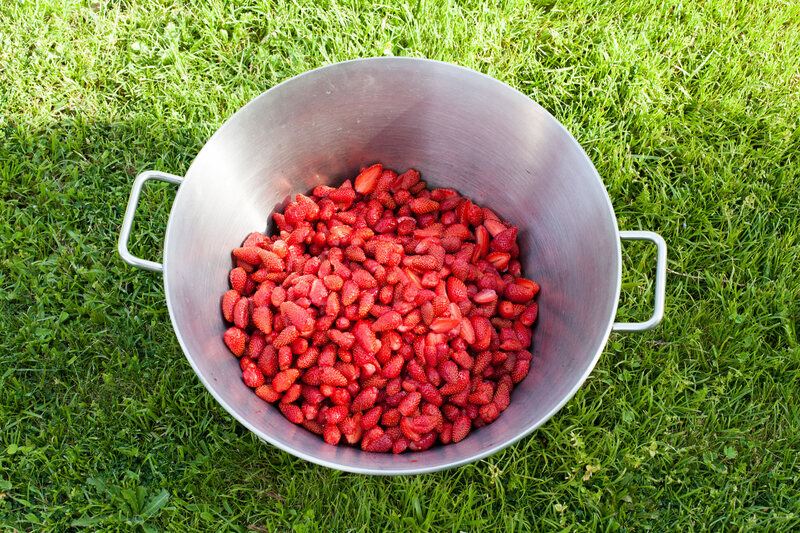 We spent a lot of time making strawberry jam last week, as we wanted to keep the morsels intact. Some may prefer more time-saving options. 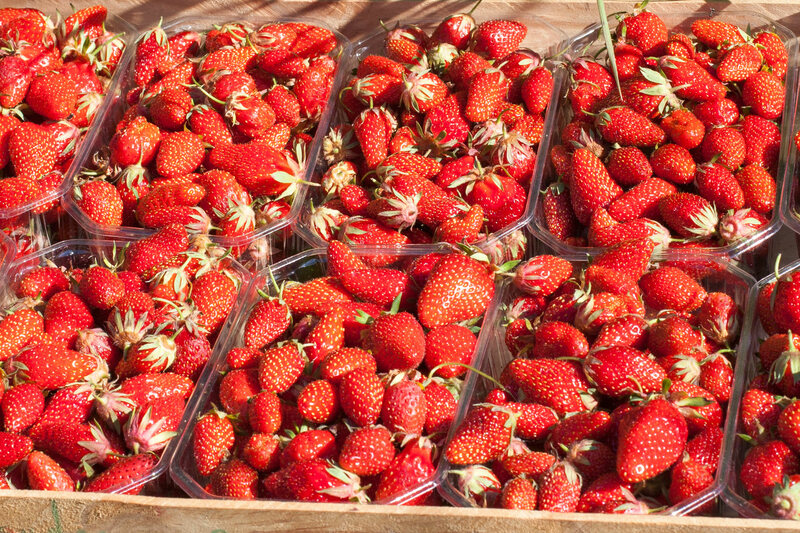 We purchased five kilogrammes of strawberries at the local market, sold as “strawberries for jam”. They were of various sizes, many smaller and some with an irregular shape. It was perfect for what we intended to do: make a jam in which strawberries would feel like soft sweets melting in the mouth. With ten 500g boxes of strawberries, we would make around 20 x 375g jars (= standard Bonne Maman jar). Photo 21 May, Aurillac, France. … And kept some of the largest ones to eat fresh (which by the way made a cheap dessert). The process resulted in strawberry pieces between one and two centimeters long, all having approximately the same volume. It took us a bit less than an hour to wash, hull and slice the five kilogrammes, 500g box after 500g box. So, how can you go faster? An alternative is to go for larger strawberries. Four times bigger strawberries means four times less hulling. You can also buy a smaller quantity. It will take one fifth of the time to prepare one kilo rather than five, as washing up a knife, a sauce pan and throwing away the stems will take no time at all. We applied the recipe number 4 presented in our 31 May 2015 post. It is the most time-consuming of the four recipes proposed. According to the recipe, we left the strawberries soak into the sugar for a while before heating them once, stopping just before boiling, then a second time 24 hours later, before cooking the jam on day three. Cooked jam on day three, just before pouring it into the jars. Photo 24 May. The kind of final result you get with this method. Remember this? 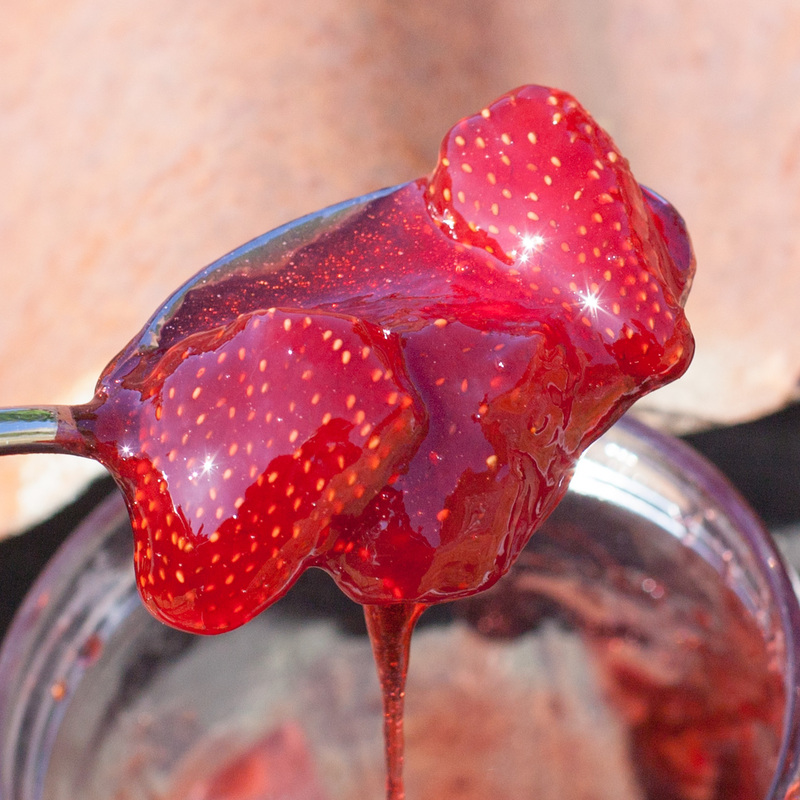 See our 31 May 2015 post “Strawberry jam“. Photo 31 May 2015. You can apply the other recipes listed in our 31 May 2015 post, in particular N°1, Jamie Oliver’s. Actually all of them will save you the time-consuming candying process. 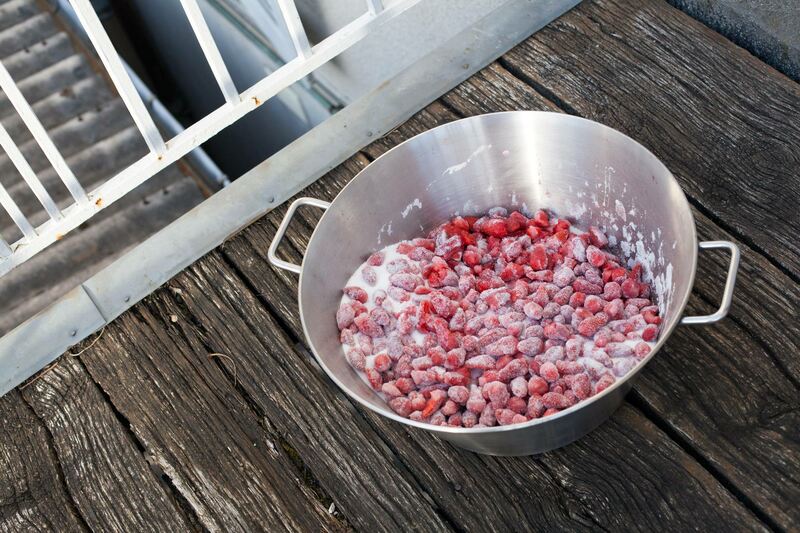 You can also avoid slicing the strawberries: once in the jam pan, crush them with a potato masher and the sugar. It won’t take more than two minutes even for 5kg of strawberries and 3.5kg of sugar! 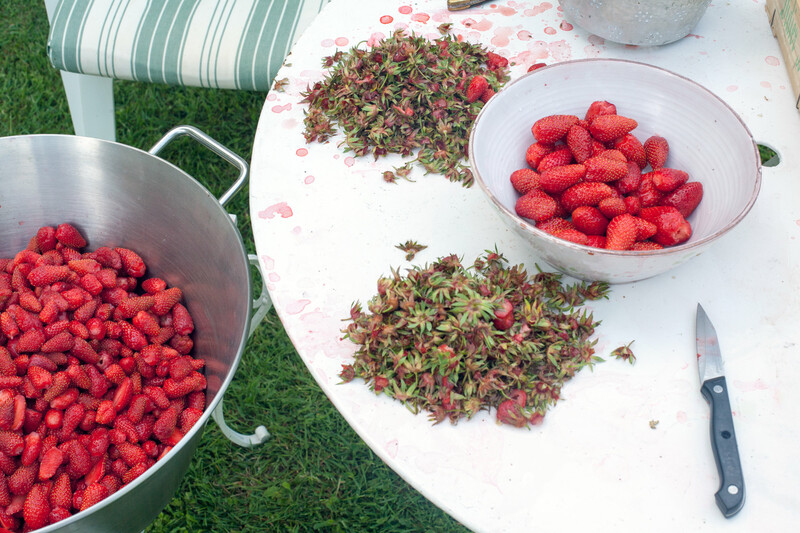 So, let’s sum up… Buy a kilo of large strawberries to avoid hulling too much, crush them with the sugar and cook the jam for five minutes… Should that take more than quarter of an hour, including pouring the jam in the jars and washing up the dishes? If you plan to eat it within a week you don’t have to bother boiling the jars… Just keep them in the fridge if you want to. 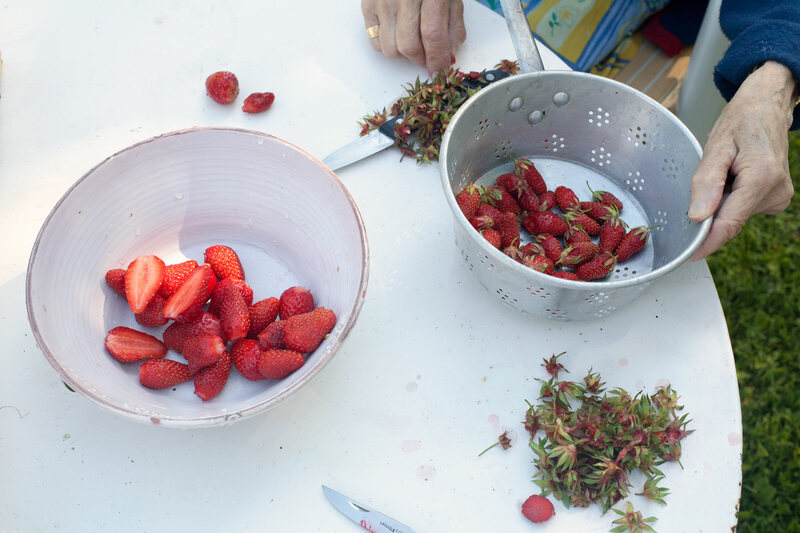 And if you don’t mind morsels or like them but don’t want to bother making sure you will get them with the kind of consistency we are after with recipe N°4, you can also slice the strawberries rather than crushing them and make the jam without the candying process. 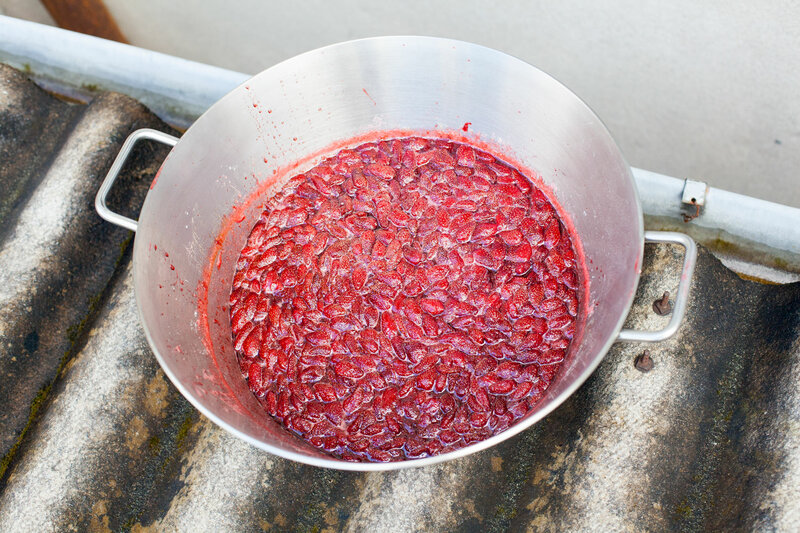 You will very probably end up with more or less strawberry pieces in the jam, depending on a number of factors I haven’t tested so far such as strawberry cultivar and ripeness. We might also mix with other fruit and add spices… This will probably make the next chapter of the strawberry jam story of this blog. Achieve the “morsel effect” with wild strawberries? We could as well try to work with wild strawberries, probably four times smaller than the smallest strawberries we processed last week. What a treat would that be? Well, wild strawberries are expensive and usually sold in small quantities, if in stock at all. But if you feel like trying someday, two hundred and fifty to five hundred grammes of them must be enough to make a few small jars. You might have to repeat the candying process several times before cooking the jam though, as wild strawberry flesh melts much more easily. Surely, it would make a special treat too! This entry was posted in Eat and tagged Aurillac, France, Strawberries by Les Jardins d'ici. Bookmark the permalink.